As businesses grow, you're managing rapidly expanding but isolated pools of data from many sources that are used by any number of applications and business processes. Today, many companies struggle with a fragmented storage portfolio that adds complexity and slows down innovation for business applications. Object storage helps you break down these silos by providing massively scalable, cost-effective storage to store any type of data in its native format. With AWS object storage solutions like Amazon Simple Storage Service (Amazon S3) and Amazon Glacier, you manage your storage in one place with an easy-to-use application interface. You can use policies to optimize storage costs, tiering between different storage classes automatically. AWS makes storage easier to use to perform analysis, gain insights, and make better decisions faster. 2. Security & Compliance - Amazon S3 & Amazon Glacier are the only cloud storage services that support three different forms of encryption. AWS CloudTrail provides API call monitoring and logging. Amazon Macie provides an AI-powered security service that continuously monitors use of your data to detect anomalies, and then alerts you to take action to prevent data loss or inadvertent sharing. Amazon S3 & Glacier support more security standards and compliance certifications than any other offering, including PCI-DSS, HIPAA/HITECH, FedRAMP, SEC Rule 17-a-4, EU Data Protection Directive, FISMA and many more, helping satisfy compliance requirements for virtually every regulatory agency around the globe. 3. Flexible Management - AWS offers the most flexible set of storage management and administration capabilities. Storage administrators can classify, report and visualize data usage trends to reduce costs and improve service levels. Objects can be tagged with unique, customizable metadata so customers can see and control storage consumption, cost, and security separately for each workload. The S3 Inventory tool delivers scheduled reports about objects and their metadata for maintenance, compliance, or analytics operations. Amazon S3 can also analyze object access patterns to build lifecycle policies that automate tiering, deletion, and retention. And finally, since Amazon S3 works with AWS Lambda, customers can log activities, define alerts, and invoke workflows, all without managing any additional infrastructure. AWS is the only provider to offer this integrated collection of powerful management capabilities. 4. Query-in-Place - Amazon S3 is the only cloud storage platform that lets customers run sophisticated analytics on their data without requiring them to extract and move the data to a separate analytics database. Anyone who knows SQL can use Amazon Athena to analyze vast amounts of unstructured data in Amazon S3 on-demand. With Amazon Redshift Spectrum, customer can run sophisticated analytics against exabytes of data in S3, and run queries that span both the data you have in S3 and in your Redshift data warehouses. 5. Broadest Ecosystem - In addition to integration with most AWS services, the Amazon S3 & Amazon Glacier ecosystem includes tens of thousands of consulting, systems integrator, and ISV partners, with more joining every month. And the AWS Marketplace offers 35 categories and more than 3,500 software listings from over 1,100 Independent Software Vendors that are pre-configured to deploy on the AWS Cloud. This means customers can easily use S3 and Glacier with popular Backup, Restore, and Archiving solutions, the best Big Data solutions, innovative Disaster Recovery solutions, and the latest on-premises primary storage environments. No other cloud provider has more partners with solutions that are pre-integrated to work with their object storage service. Amazon S3 offers a highly durable, scalable, and secure destination for backing up and archiving your critical data. You can use S3’s versioning capability to provide even further protection for your stored data. You can also define lifecycle rules to automatically migrate less frequently accessed data to S3 Standard - Infrequent Access and archive sets of objects to Amazon Glacier. Amazon S3 and Amazon Glacier provide a range of storage classes to meet the needs of compliance archives for regulated industries or active archives for organizations who need fast, infrequent access to archive data. Amazon Glacier Vault Lock provides write-once-read-many (WORM) storage to meet compliance requirements for records retention. Lifecycle policies make transitioning data from Amazon S3 to Amazon Glacier simple, helping automate the transition based on customer-defined policies. Whether you’re storing pharmaceutical or financial data, or multimedia files such as photos and videos, Amazon S3 can be used as your data lake for big data analytics. Amazon Web Services offers a comprehensive portfolio of services to help you manage big data by reducing costs, scaling to meet demand, and increasing the speed of innovation. Amazon S3 is the only cloud storage service that allows you to query your data in place, eliminating the need for costly and time-consuming extract, transform, and load (ETL) processes. The AWS Storage Gateway helps you build hybrid cloud storage, augmenting your existing local storage environment with the durability and scale of Amazon S3. Use it to burst a workload from your site into the cloud for processing and then bring the results back. 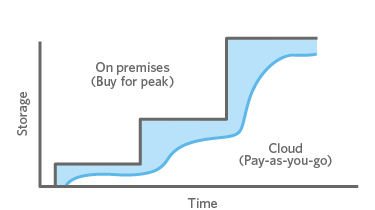 Tier colder or less valuable data off of your primary storage into the cloud to lower costs and extend your on-prem investment. Or simply use it to incrementally move data into S3 as a part of backup or migration projects. Amazon S3 provides high performance, highly available storage that makes it easy to scale and maintain cost-effective mobile and Internet-based apps that run fast. With S3, you can add any amount of content and access it from anywhere, so you can deploy applications faster and reach more customers. Amazon S3’s highly durable, secure, global infrastructure offers a robust disaster recovery solution designed to provide superior data protection. Cross-Region Replication (CRR) automatically replicates every S3 object to a destination bucket located in a different AWS region. Amazon S3 & Amazon Glacier run on the world’s largest global cloud infrastructure, comprised of Availability Zones (AZs) and Regions around the world. These Availability Zones offer the ability to operate production applications and databases which are more highly available, fault tolerant, and scalable than would be possible from a single data center. Data written to S3 is redundantly stored across three AZs and multiple devices within each AZ to achieve 99.999999999% durability. Amazon S3 is the largest-scale object storage service of any cloud infrastructure provider, with a total storage capacity that Gartner says "dwarfs the other vendors" of cloud infrastructure. S3 automatically scales performance so applications don’t slow down as data grows. You can deploy applications that reach more users faster because S3 stores any amount of content and lets them access it from anywhere. Amazon S3 is the only cloud storage platform that allows you to run sophisticated big data analytics directly on your data at rest without requiring you to extract the data and load it into a separate analytics system. You can query S3 data without any additional infrastructure using Amazon Athena or Amazon Redshift Spectrum, and only pay for the queries you run. This makes analysis of vast amounts of unstructured data accessible to anyone that can use SQL, and makes it far more cost effective than traditional Extract, Transform and Load (ETL) processes. You can choose from the widest range of options to transfer your data into (or out of) Amazon S3 & Amazon Glacier. S3’s simple and reliable APIs make it easy to transfer data over the Internet. Amazon S3 Transfer Acceleration is ideal for larger objects that need to be uploaded across large geographical distances. AWS Direct Connect provides consistently high bandwidth and low latencies for transferring large amounts of data to AWS using a dedicated network connection. You can use AWS Snowball and AWS Snowball Edge appliances for petabyte-scale data transfer, or AWS Snowmobile for even larger datasets. AWS Storage Gateway provides you a physical or virtual appliance to use on-premises to easily move volumes or files into the AWS Cloud. Once you have your data on Amazon S3 & Amazon Glacier, you have the most complete set of storage management and administration capabilities available in the cloud. With S3, you can use policies to match your financial goals, compliance regulations, and corporate business policies. S3’s powerful policy engine means you can manage your storage by your business goal, instead of relying on the disparate capabilities offered by different legacy providers. Amazon S3 & Amazon Glacier help protect your data against both internal and external threats and maintain regulatory compliance, with support for more security standards and compliance certifications than any other cloud platform. S3 & Glacier include a broad range of certifications including PCI-DSS, HIPAA/HITECH, FedRAMP, SEC Rule 17-a-4, EU Data Protection Directive, FISMA, and many more for virtually every agency around the globe. In addition to integration with most AWS services, the Amazon S3 ecosystem includes tens of thousands of consulting/systems integrator and technology/independent software vendor AWS Partner Network partners who have adapted their services and software to work with S3 for solutions like Backup & Recovery, Archiving, and Disaster Recovery. And the AWS Marketplace offers 35 categories and more than 3,500 software listings from over 1,100 ISVs. Over ten thousand new partners joined the AWS Partner Network in the past 12 months, including thousands of new Technology and Consulting Partners. There are three types of cloud storage: Object, File, and Block. Each offers their own unique advantages. 1. Object Storage - Applications developed in the cloud often take advantage of object storage's vast scalability and metadata characteristics. Object storage solutions like Amazon Simple Storage Service (Amazon S3) are ideal for building modern applications from scratch that require scale and flexibility, and can also be used to import existing data stores for analytics, backup, or archive. 2. File Storage - Many applications need to access shared files and require a file system. This type of storage is often supported with a Network Attached Storage (NAS) server. File storage solutions like Amazon Elastic File System (EFS) are ideal for use cases like large content repositories, development environments, media stores, or user home directories. 3. Block Storage - Other enterprise applications like databases or ERP systems often require dedicated, low latency storage for each host. This is analogous to direct-attached storage (DAS) or a Storage Area Network (SAN). Block-based cloud storage solutions like Amazon Elastic Block Store (EBS) are provisioned with each virtual server and offer the ultra-low latency required for high performance workloads.